Catch Our Drift Productions aims to publish books that can transform our world, shift our perceptions and open our minds to what could be. We also want to inform and entertain. We are not focused on one particular style or genre; we simply want to publish great books that make people laugh, cry and think. We are not accepting submissions at this time, but we are always interested in talking about books! Feel free to contact us anytime. Bernard Kirby, a loveable loser with a passion for video games and classic films, moves back into his parents’ home following the breakup of his unlikely marriage to Stephanie Hansen. When Bernard receives an invitation to Stephanie’s second wedding, he enlists the help of reliable wingman Arnie Ganesh to derail the festivities. love of his life by revisiting the couples from every wedding he has attended. In this collection of heartwarming stories, Sheila Cameron shares inspirational examples of how even small steps have the potential to create ripples of light through the universe. Cameron shares personal experiences about what led her to make conscious and often unconventional choices about parenting, diet, finances, the environment and more -- and about the lasting and cumulative effect of those changes. Sleepwalking through life on a quiet island near Seattle, Oliver Bruce is struck twice in one day. Emerging unscathed from an accident that leaves his SUV a crumpled mess, Oliver finds a fragment of a letter about an invention that could change the global energy landscape. The discovery brings Oliver face-to-face with the widening chasm between his mundane existence as a middle-aged family man and the richer life he longs for. Oliver is drawn to locate the invention by embarking on a journey to the jungles of Ecuador, where he places trust in an enigmatic young beauty—while believing with increasing certainty that he is being followed. 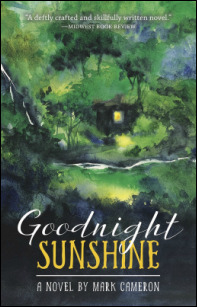 Told against a backdrop of colorful characters and exotic locations, Goodnight Sunshine unwinds Oliver's gradual descent from youthful optimism to mid-life malaise, ultimately forcing him to re-evaluate his core beliefs and face the true source of his discontent.